On 23rd August 1914 both the English and German forces believed they had witnessed a miracle. Some saw St George and a legion of bowmen others said that angels had surrounded the English in a wall of protection. Whether it was divine or supernatural intervention or not, the fact remains that the heavily outnumbered British Expeditionary Forces were being forced to retreat under heavy fire. Something turned the tide. A further tale has it that a group of soldiers belonging to the Coldstream Guards got lost in the Mormal Forest and became aware that they were close to being discovered until a tall, slim female figure appeared to them. She wore a white flowing gown and appeared to be glowing. The soldiers followed her across a field where she showed them a hidden road which allowed them to escape. 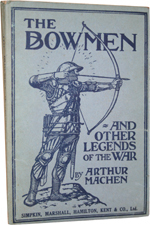 Arthur Machen, a Welsh author, published a short story entitled “The Bowmen” on 29th September 1914 and insisted that this was the inspiration for the story of the Angel of Mons, but would this story spread far enough to account for the tales told by English and overseas forces alike? One of the other ideas to account for the tales is that fog and rain caused unusual cloud formations or poor visibility that gave rise to unusual sightings, but this can be discounted since the sun came out from around 10 am that day. You can read a more in-depth investigation of The Angel of Mons by Alan S. Coulson MD, PhD. and Michael E. Hanlon here. They even include pictures, maps and theories on the legend. Continuing the explanation of how supernatural beings and events work in the Blackfeather Series of books. The angelic beings in Blackfeather, be they fallen angels, watchers or demons, all possess a wide range of abilities and put them to use in various situations. This subtle ability is used on humans and animals in order to achieve a certain outcome. For instance, you may suddenly find yourself thinking what a great idea it would be to visit a certain place, only to find when you arrive that an old friend you haven’t seen for years is also there.Kate is manipulated several times in the book and so are those around her. In the church, Ash’s brother cajoles her into digging up the box and suggests she takes it home. When she becomes resistant to this idea he becomes more forceful and compels her to take it. He is, of course, a Watcher and is acting in the best interests of his brother, but he might well be breaking angelic laws over this and have to face consequences later. Ash, as a fallen angel, possesses this power too and uses it to gently persuade Brian to leave the nightclub instead of fighting him and later he uses it on a wider scale to influence the crowds at the Festival of Angels. Under his guidance the crowd parts to allow himself and Kate, who has a fear of crowds and small places, through unhindered, and later he compels diners to leave a busy pub so that he and Kate can get a table and have dinner together. Demons would use this power for nefarious ends and to manipulate people into committing anything from petty theft to horrific crimes and acts of violence. Of course, humans have free will and so could easily resist this manipulation if they so wished. Angelic beings can merely suggest a course of action, it would be no use for a demon to suggest murder, for instance, to someone totally opposed to this action. It unnerved her, the way he knew she was there, even with his back to her and his earphones in. She wasn’t going to argue with him and watched as he dished up a generous helping of baked beans. He was humming a tune she knew well now and it sounded good. Good enough for a choir. Choir of angels, said a voice in her head. He placed the plate in front of her and poured real coffee from her mother’s best silver coffee pot, then looked up to find her wary eyes on him. This ability becomes very useful if you want to conduct a private conversation that can’t be overheard by others. It is also great for communicating over vast distances. Angelic beings may have the means to block or divert other angelics from their mind at will. Most demons do this as a matter of course, as they don’t even trust their own brethren.